The ITPA Topical Group on Diagnostics advises the ITER Organization on diagnostic requirements, organizes joint experiments on diagnostic techniques, supports ITER operation and advances diagnostics for DEMO and future reactors. The International Tokamak Physics Activity (ITPA) Topical Group on Diagnostics (Diagnostic TG) held its 25th meeting at the ITER site from 15-18 October. 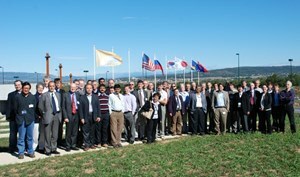 The group has a wide remit, starting from advising the ITER Organization on diagnostic requirements, passing through proposing, planning and reporting on joint experiments on diagnostic techniques and analysis, and culminating with supporting ITER operation and advancing diagnostics for DEMO and future reactors. At the meeting, chaired by Yasunori Kawano, extensive progress was reported on mirror cleaning techniques for optical measurements. This type of technology will be deployed for the first time in ITER, where the extended plasma burn times (4700 hours) combined with the high energy bombardment of the first-wall components can lead to rough mixed-metal build-up on the mirrors. Progress was also made in understanding and reducing the impact of wall reflections. For all-metal wall machines such as ITER, these can distort or even mask the signals from optical diagnostics. A discussion on escaping alpha particles produced in the fusion burn resulted in the launching a new activity for further investigation, including a proposed new method. Measurements and techniques for dust, tritium and erosion were discussed in a special session. These measurements are needed so ITER can plan its operation and maintenance well within regulatory limits and to gain understanding on the way to DEMO. A new joint experiment for the systematic comparison of Charge Exchange Recombination Spectroscopy and X-ray Imaging Crystal Spectroscopy was presented. These diagnostics measure ion temperature and plasma rotation—both parameters necessary to steering the machine. The group also discussed progress with neutron calibration during a special two-day ITER Organization workshop. This is an important area for ITER, both for regulatory compliance and to reduce the uncertainties in extrapolating ITER performance to DEMO. This was the first meeting of the Diagnostic TG to be held at ITER Headquarters, and the first to make use of remote participation in the auditorium. It was combined with a one-day progress meeting of ITER Organization Diagnostics Division. "Participation was better than average, with all parties represented and good progress in key areas reported," said Chair Kawano. The group's next meeting is planned for the first week of June 2014, in Korea.